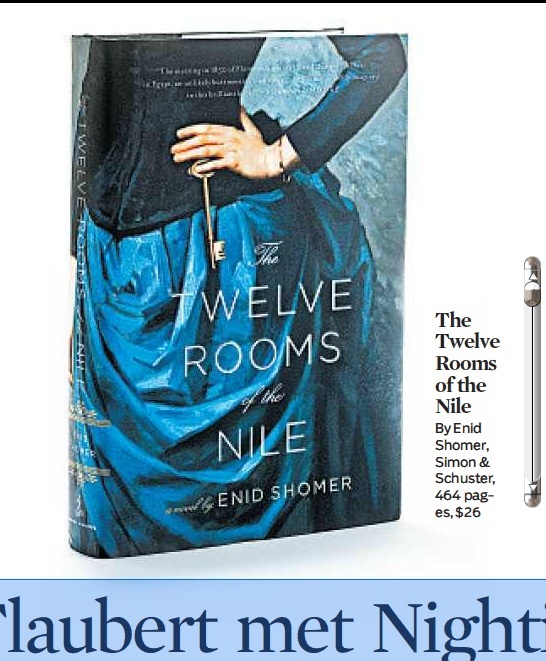 Enid Shomer makes beautiful sentences; she always has. As a poet and writer of short fiction she has dazzled, forging unexpected liaisons between found details and arcane history, simple living and extravagant loss. She knows a lot—about the world, about words. She forces readers (this one, anyway) to crack the binding on the old two-volume Shorter Oxford. What does proleptic mean? How close an alliance can intellect and jackdaw be said to have? And when is the last time you saw pentimenti used to describe the veins in a keening woman’s temple? Shomer keeps you on your toes, I’m saying, and with The Twelve Rooms of the Nile, her first full-length novel, she has given herself the surely unexpected and inevitably complicated task of pairing two nineteen century personalities—Gustave Flaubert and Florence Nightingale—in a shared adventure up the Nile. History places the two in the same vicinity at the same time, we learn from Shomer’s back-page notes. History does not make the claim, however, that the despairing author and eventual Angel of the Crimea ever met in that fated year of 1849; if anything, the two merely glimpsed each other in passing. Shomer is interested in what might have been, and she dedicates well over 400 pages to this intriguing fancy.